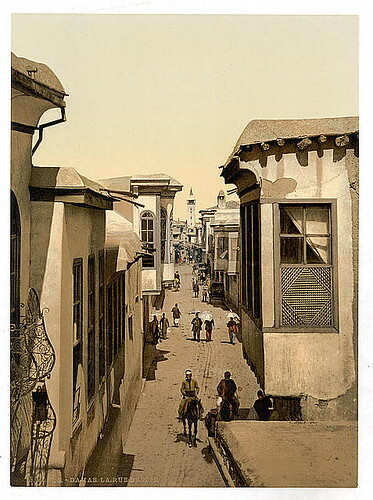 I found this photo of Souq El Taweel, or Midhat Pasha (also known as the Street Called Straight) at the US Historical Archive website. But I don't know what year was it taken in. "The street called Straight is straighter than a corkscrew, but not as straight as a rainbow. St. Luke is careful not to commit himself; he does not say it is the street which is straight, but "the street which is called Straight." It is the only facetious remark in the Bible,I believe." I never thought of why it's been called "The Straight Street" or "Via Recta"! hmmm, anybody looked it up? don't tell me cuz it's straight! !....that applies on Hamra street, Salhieh, and almost all the streets in the world! actually what drew my attention was not the title of the street but the roof and the window of the house..
how did u find my blog dude? oh yeah by the way, i know it roks! I think the Romans were masters at making streets perfectly straight. in Apamea for instance you can look through the columns in the main street and it will appear to you as if it is just one column, so is the case for Palmyra. it's so cool to learn about the Biblical reference to it but was it reffered to this street specifically? Is there a credible evidence to this? Thanks for any extra info that you provide. Ihsan: I guess it is called straight, well because it is straight! Yazan: I didn't know that before. Ayman: Thanks :) I just read it and it is really interesting. Nour: It does, doesn't it? Dina, thanx for the link. Looking forward to reading more of your posts. paul was on crooked path and God positioned him by experiences of him self face to voice and ear to ear with others present and a removing of his sight showing saul his power and then showing him his love thus restoring his sight and commissioning him to work for the same God he was out to destory.